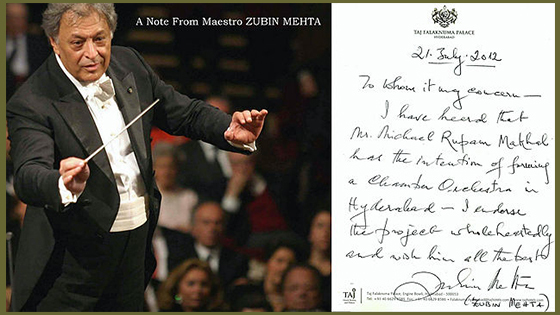 March 21, 2016, 9:58 AM · In a fine morning, I woke up with the news in the daily, that, Maestro Zubin Mehta is in Town (Hyderabad). The first thing hit the core of my belly was, can I meet him? Thats it, I was hooked to that urge for few minutes and couldn't help but googling to find out where he has put up in Hyderabad. It didn't take long and I found that he is staying in the Taj Falaknuma Palace. I rang the TFP number and the receptionist picked up the call. I, very politely asked her if I could speak to Mr. Zubin Mehta and she said, please hold on Sir I am connecting the call to him. O boy, I was not prepared for that, not at all. I thought, they will say No and I will have to struggle to speak to him and by the time I will get him on line I will be ready with my words. But, probably the man with a great heart had that hot-line open for friends and well-wishers to call and have a chat with him. When I was thinking all these, a Tenor voice appeared from the other side, "Hello" and I, with great humility greeted the Maestro and before he could speak anything, I reeled out everything what was in my heart: About my father Ananta Makhal, who was a conductor of Calcutta Chamber Orchestra, which was also an orchestra where Mr. Mehta's father Meli Mehta has worked before moved back to Mumabi. I told him about my orchestra and what my plans are, how things are difficult here to promote western classical music, how I am getting musicians and doing shows in private events and how I want to take it to the next level etc. etc. etc. and if I could meet him for a little while to talk more about my orchestra and future plans. He listened all with great patience and replied me with great humility, that, he is here for two days only and would have loved to meet me, but the schedules are already overloaded, so meeting seems to be very tough. After a short pause, he said, Michael - I like what you are doing and I would be happy to write a short note - kind of a recommendation note for you if you think that would help you in any ways. I jumped on my chair, but controlled myself in a fraction of a second and told him: Mr. Mehta, that would be wonderful, it will really help me in the journey. He said, come tomorrow and collect it from the reception. I did that, couldn't sleep whole night and next day, when I reached the Taj Falaknuma Palace, the receptionist handed me over this note, written by the Maestro on a TFP notepad just like the good old royal musicians: "To whom it may concern, I have heard that Mr. Michael Rupam Makhal has the intention of forming a Chamber Orchestra in Hyderabad - I endorse the project wholeheartedly and wish him all the best". The truth is, I hardly showed this letter to anyone for any benefit of the orchestra or any other purpose. I shared it on social networking sites for my friends and family. It is more like a priceless souvenir to me. I will definitely use it for the purpose Maestro spared his precious time and wrote it with such great love and humility when I will come across such apt opportunity. I am striving for that day, working hard, to make Mr. Mehta feel proud of his pledge he made for a project based on the words of a person he never seen or met. The thought of such humility gets me every time I think about it. God bless Mr. Mehta, a great musician and moreover, an amazing role model and an exceptionally humble human.